Posted October 28th, 2010 at 1:01 pm. Previously called “Kaleidoscope,” 360˚ is a cluster of courses that connect a group of students and faculty in a single semester (or in some cases across contiguous semesters) to focus on common problems, themes, and experiences for the purposes of research and scholarship. 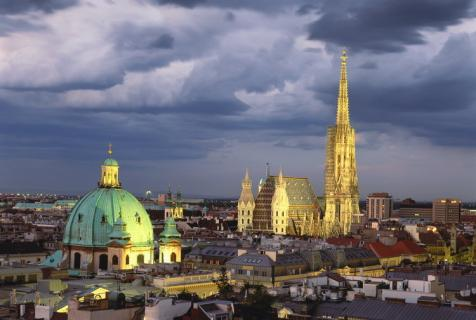 360˚: Vienna 1900 is an integrated two-credit course that will include archival work, Web-based projects, and a trip to New York museums to see original examples of art and design produced in Vienna at the turn of the 20th century. The course will also give students the exciting opportunity to conduct field research in the city of Vienna itself over spring break. The professors are hoping to share the work done in this seminar with a wider audience, possibly through a virtual exhibit space that students could use to present and exchange ideas and to showcase research findings. Students can register for spring semester classes via Virtual Bryn Mawr beginning November 1. Registration for 360°: Vienna 1900 closes at midnight on Nov. 4. Go to the TriCollege Course Guide for a full list of available courses. “We think that framing the analysis of Viennese art, architecture, psychoanalysis, and literature within discussions of the history and concept of empire is a very fruitful approach that yields insights not just into the specific culture of Vienna around 1900, but also into the political crises that shake a rapidly modernizing Europe at the turn of the last century—crises that ultimately helped give birth to modernism,” write the professors in their description of the 360˚. 360˚ Vienna is interdisciplinary in nature, and students will study works of art, architecture, design, literature, psychoanalysis, and pseudoscience. The seminar will feature critical discussions of visual culture, literary works, and psychoanalytic texts by artists and writers such as Sigmund Freud, Hugo von Hofmannsthal, Josef Hoffmann, Gustav Klimt, Oskar Kokoschka, Adolf Loos, Robert Musil, Egon Schiele, Arthur Schnitzler, Otto Wagner, and Otto Weininger. Over spring break, students will have the opportunity to travel to Vienna to conduct field work for their research projects. Seminar members will visit the Leopold Museum, the Jüdisches Museum, Sezession Hall, the Oberes Belvedere, and many other museums that house famous turn-of-the-century art work and design pieces. A trip to the Sigmund Freud Museum will allow students to view films taken of Freud during the last years of his life, some of Freud’s letters, and pieces from his collection of artifacts. The seminar members will also visit many examples of late 19th- and early 20th-century architecture. And a visit to one of Vienna’s famous coffee houses, such as the Café Griensteidl, where turn-of-the-century writers and intellectuals used to congregate, is, of course, a must. The seminar will also take a field trip to New York City to visit the Neue Galerie for German and Austrian Art, which houses key works by Klimt, Schiele, and Kokoschka and a wide range of objects of decorative art and interior design produced by the Wiener Werkstätte (Vienna Workshop) for modern design. Hertel and Meyer are very excited about the opportunity to contribute a course to the 360˚ program. In future years, they hope to collaborate with colleagues in other humanities and social science disciplines to create a cluster of courses focused on the issue of empire.